How often do you ask a roofer to check your roof? Many homeowners do not recognize that their roof have problems, unless they experience leaking. You can avoid this scenario by becoming proactive on inspection and maintenance. Better yet, know the signs when it’s time to replace your roof. 1. Old age. Start by identifying the age of your roofing. If you can’t remember the actual age of your roof, check your installation documents. Experts say that the typical age of a roof falls between 20 to 25 years. Older roofs will no longer perform like before, so plan a replacement soon. 2. Shingle issues. Grab a pair of binoculars and check your roof from where you’re standing. 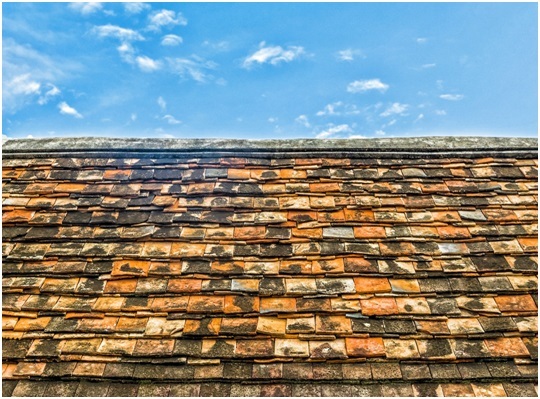 Common signs of roof failure include shingles that are curling, buckling, missing, and damaged. If you see any of these symptoms, contact your local roofer right away. 3. Granulation. Granulating shingles are normal, but not when it’s too much. Check if the granules are reaching all the way down to your . Losing more granules means that your roof is nearing the end of its service life. 4. Moss and algae buildup. The presence of moss and algae on a roof means that there is moisture trapped inside. Asphalt shingles contain limestone – the number one food for algae. These substances are not just unsightly but also result in accelerated roof deterioration. 5. Rotting wood. Lastly, if you see any rotting wood part on your roof, then you need a replacement immediately. Rotting can usually be found along your roof’s valleys, eaves, flashing, and walls. These areas are difficult to inspect for a homeowner. Be sure to ask Rogers Roofing to examine these areas. Let us know if you can relate to any of these instances. We are here to help keep your roofing in Crown Point, IN, in excellent shape. Our team can work on asphalt shingles and concrete tile roofs. We take care of various roof problems, including replacement and storm damage. For more information on our products and services, call us at (219) 228-8210. We’ll be here to assist you with your needs.